Nissan shares fell 2% on Friday after the firm suspended domestic production for two weeks over concerns with its inspection procedures. The firm will stop production at its six Japanese plants to ensure they comply with safety regulations. Earlier this month Nissan recalled 1.2m cars after uncertified inspectors conducted checks on domestic models. Japan's Transport Minister, Keiichi Ishii, said it was unclear how long the misconduct had been going on. His comments were in response to a report by national broadcaster NHK, which said the practice had been going on for 20 years. Nissan has declined to directly confirm or deny the NHK report. 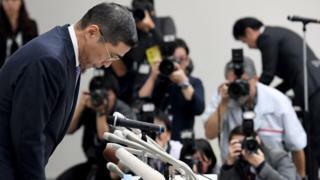 At a press conference on Thursday, however, Nissan's chief executive Hiroto Saikawa said the company's procedure for certifying vehicle inspection staff had not changed for two decades. Checks by uncertified technicians continued even after Nissan had said it had strengthened its inspection processes, when the issue first came to light late last month. Nissan will continue to produce vehicles for export, as the certification process for final inspections does not apply to vehicles shipped overseas. The firm, which is Japan's second-largest carmaker, produced roughly 79,300 passenger and commercial vehicles in Japan in August, including 27,600 for the domestic market. The issue has tarnished Nissan's brand, and along with scandals at Kobe Steel and Takata Airbags, could have an impact on Japan's reputation for quality. What is happening with Japan Inc?